We don’t hear too much from Google about nofollow anymore, aside from how it relates to the disavow file and scenarios when Google suggests website owners should use it. Nofollow is a link tool webmasters can use on-page to be able to tell Google that they are unwilling to vouch for a link, or that it was a paid link of some variety, so Google should not use it for PageRank calculations or for any link based manual actions. Nofollow has not changed. It is still functioning as it was since it was implemented. This probably isn’t surprising to most people, but there had been speculation that Google might have changed how it handles nofollow since it was originally launched, or a change with how it was handled after the change to real time Penguin. Mostly, speculation revolved around the use of nofollow on paid links, and if the use of nofollow was passing any negative connotations to those nofollowed links. More recently, people have been wondering about impact on a site if they nofollow all links, both external and internal. That said, when nofollows are added later, or removed later, it can take some time before Google recognizes the change in the link. So until Google recrawls the page with the link, it will treat it as it was prior to the change. This can be speeded up by using Google’s fetch and submit tool, especially on a page that might not be crawled frequently. 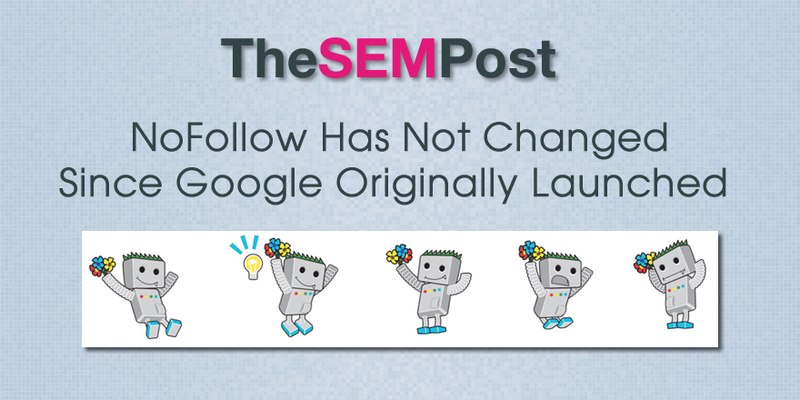 Bottom line, Google hasn’t changed how it handles nofollows, it is still working as it did when originally launched by Google.